"We have enjoyed 100 percent uptime since acquiring our Horizon"
Hilton Head, SC, boasts world-class golf, beaches and a host of top-of-the line leisure opportunities that have made it one of the fastest growing cities in the state. Now, thanks to A. Joseph Borelli, M.D., fellowship-trained radiologist and entrepreneur, it also offers a world-class medical imaging facility to serve its burgeoning population, which is increasingly flocking to the attractive island community year round. "I saw an opportunity to really raise the bar on imaging services in Hilton Head," said Borelli, who had headed up highly successful East Coast imaging centers before setting his sights down South. 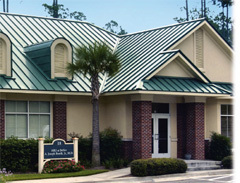 "With a large number of seniors and an affluent standard of living, Hilton Head had a growing need for advanced medical imaging that was just not being met," said Borelli, who launched MRI at Belfair in April 2002 in Bluffton, SC, just over the bridge from the island resort. Beaufort County, which includes Hilton Head, was serviced by seven other MRI facilities at that time and didn't have a single 1.5T imager before Belfair opened its doors. In large part, the center built its business plan around offering the best technology available — from its state-of-the-art scanner to its advanced Codonics Horizon Ci Multi-media Dry Imager — to place it in a distinct class by itself and fuel its rapid growth. Convinced of the merit of Borelli's endeavor, GE Healthcare agreed to make Belfair a clinical evaluation site and an international show site, enabling it to deliver an enhanced level of cutting edge services with its GE TwinSpeed MRI months before these would be available anywhere else. With all this advanced technology, perhaps surprisingly, Borelli felt a leading edge film and multi-media dry imager was an essential part of his plan. "Image quality is critically important to us and Horizon's image quality is superb. The quality is superior to the traditional film imagers we were previously using," said Borelli. The savvy physician relies on the Horizon Ci to provide cost-effective, highest quality images to a full range of referring physicians. "We primarily use Horizon as our MR TwinSpeed diagnostic imager. Horizon makes it easy to cater to the preferences of our imaging specialists and our referring physicians. In a competitive marketplacethis can't be underestimated," he noted. Horizon dry film is available in both blue and clear base media in 8"x10" and 14"x17" sizes, as well as A and A4 medical grade ChromaVista media for color. A special advantage for Belfair's cardiac MRI applications, Horizon's color images are extremely useful to clearly visualize blood flow through heart valves and possible regurgitent flow. 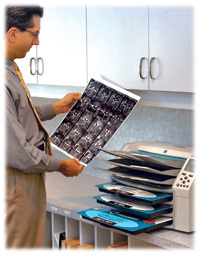 Color printing is also especially helpful in MRI spectroscopy, which examines the chemical makeup of tumors to determine how aggressively they are growing. "In general, color is a bonus for my referring physicians and is an excellent marketing feature for any practice." Complementing this is Horizon's economical, high-quality DirectVista Grayscale Paper, which is a reflective medical media specially created for applications in a variety of sizes. Eliminating the need for a lightbox, it is a great choice for referring physicians. Plus, radiologists appreciate its price point, which is significantly below film. "Codonics DirectVista Grayscale Paper is so durable it can even be used for archiving images," he commented, noting that he keeps a detailed list of the media type, size, and format that every referring physician prefers. "It's an extra level of service and good marketing that has paid off handsomely." As the area's leading imaging center, MRI at Belfair services specialists including cardiologists who rely on diagnostic quality images and need them fast. "We were really impressed by Horizon's quality and speed. Horizon typically prints an entire four-film study before the first film is complete on other 'high-end' imagers. Horizon has really improved our technologist's workflow," said Borelli. Borelli appreciates the pre-packaged media cassettes and the fact that three can be loaded into printer simultaneously. "But, most important, I genuinely don't think any dry imager available today delivers better print quality." Borelli has been pleased to find that Horizon is an extremely reliable turnkey printing system. "We have enjoyed 100 percent uptime since acquiring our Horizon in March 2004," he said. Borelli appreciates the convenience of the pre-packaged media cassettes and the fact that three can be loaded into printer simultaneously. "But, most important, I genuinely don't think any dry imager available today delivers better print quality. The output can be carefully fine tuned to ensure it exactly duplicates what is seen on the display. The user interface is intuitive and easy to learn and that adjustments to the default settings typically are not necessary." "Even installation was a chip shot," he added with a smile, suggesting he has adapted well to his new home. At MRI at Belfair, the Horizon is set up as a network device connected to two PACS workstations, a GE ReportCARD Workstation, the GE MRI scanner console, a GE Advantage Windows Workstation and a Macintosh computer running public domain 3D and image fusion software. "Every device prints to it seamlessly and simultaneously," he said. The high-tech imager sits out in the open with all the other advanced technology, where it works quietly and unobtrusively in the large, open, modern space. It can easily be moved and has no special siting requirements.